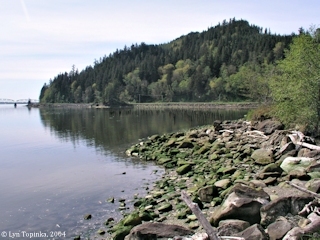 "Megler, Washington (Clark's 'Dismal Nitch')"
Click image to enlarge Megler Rest Area, looking upstream. Image taken April 9, 2004. 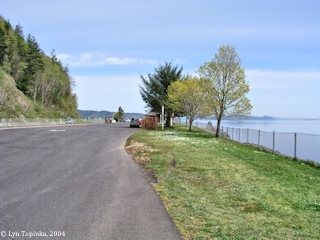 The small community of Megler is located at Columbia River Mile (RM) 15. Upstream is Megler Point, Hungry Harbor, and Cliff Point and downstream is Point Ellice and the Washington end of the Astoria-Megler Bridge. 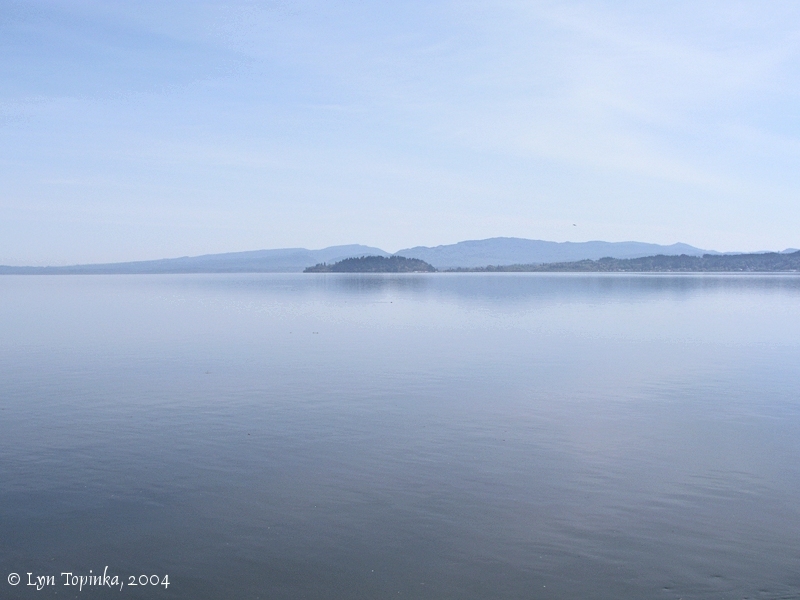 Further downstream on other side of Point Ellice is Baker Bay and the Washington town of Ilwaco. The Megler area once was the terminus of the Ilwaco Railroad and a ferry landing, complete with a waterfront restaurant. 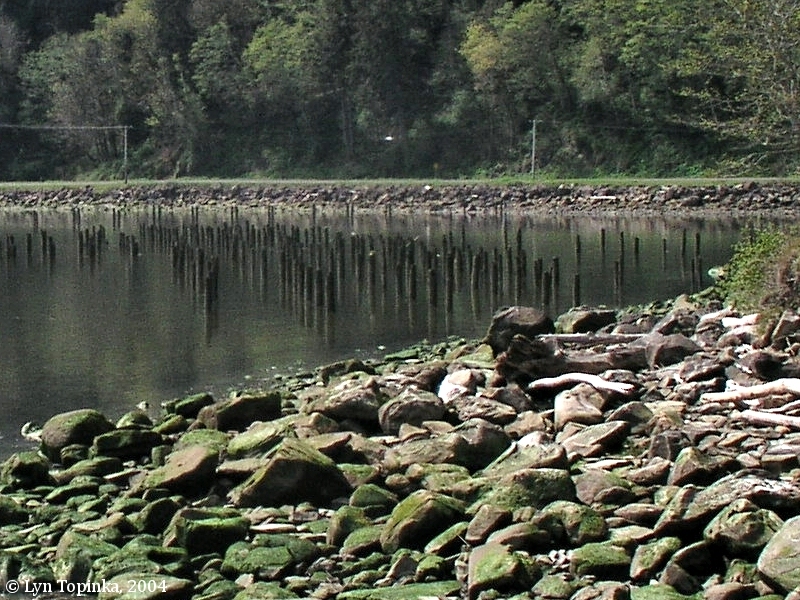 All that remains today are wood pilings in the Columbia, best seen in Megler Cove on the downstream end of the Rest Area. Megler Point, located at Columbia River Mile (RM) 15, is the point of land located between Hungry Harbor (upstream side) and Megler Cove (downstream side). Megler Point, Megler Cove, and the small community of Megler were all named for Joseph Megler, a pioneer and early Washington State legislator. Joseph Megler owned a salmon cannery near Point Ellice. The area directly to the northwest of the Megler Rest Area is believed to be the site of Lewis and Clark's "Dismal Nitch" Campsite, the second of two campsites on Megler Point. Lewis and Clark moved to Megler Cove after spending two misterable nights east of Megler Point at Hungry Harbor. The Cove was the location of Lewis and Clark's campsite of November 12-14, 1805, refered to by the men as "Dismal Nitch". 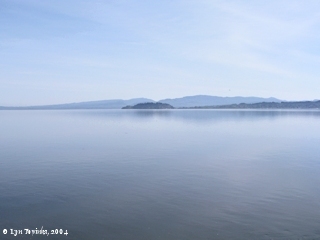 In 2004 this area became part of the Lewis and Clark National and State Historical Parks, a grouping of sites important in the Lewis and Clark story. 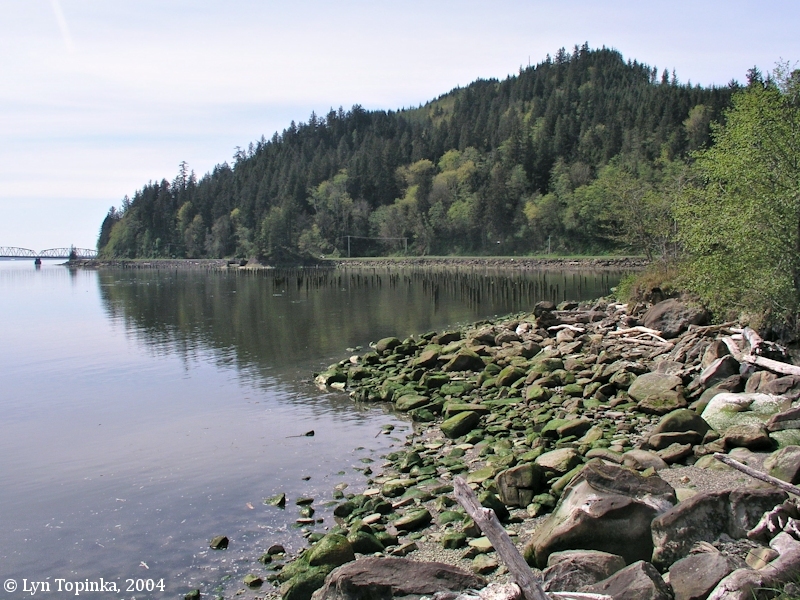 The area directly to the northwest of the Megler Rest Area is believed to be the site of Lewis and Clark's "Dismal Nitch" Campsite, the second of two campsites on Megler Point. Lewis and Clark moved to Megler Cove after spending two misterable nights east of Megler Point at Hungry Harbor. The "point" they round was Megler Point and the "Small Creek" was today's Megler Creek. Megler Creek flows into the Columbia River at River Mile (RM) _____. The creek now runs through a culvert under Highway 401. The men referred to this second campsite in the Megler area as "Dismal Nitch". Finally at 3:00 on November 15, 1805, the men left the Megler area, rounded Point Ellice (which Captain Clark called "Point Distress") and established a new camp at a "sand beach" now known as "Station Camp". The men would spend the next 10 days at "Station Camp". 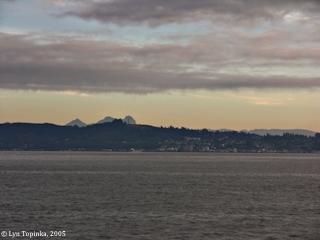 Click image to enlarge Megler Cove and Point Ellice from Megler Rest Area, Washington. The Astoria-Megler Bridge is just visible on the left. Image taken April 9, 2004. Megler was named for Joseph Megler, a pioneer, and early Washington State legislator. The U.S. Bureau of Land Management, General Land Office Records (GLO) show a Joseph G. Megler getting title to 139.9 acres on June 15, 1880 (Homestead Entry Original). "MEGLER: Abandoned Ilwaco railroad terminus and ferry dock on the Columbia River between Point Ellice and Cliff Point, 1907-1966. Named for Joseph G. Megler. Megler was born in Germany, educated in New York City, fought in the Civil War, operated a hotel in Astoria, entered the salmon cannery business at Chenookville in 1871, formed the J.G. Megler Company and founded Brookfield (Wahkiakum County) in 1873, and was a state legislator from Pacific/Wahkiakum counties for 22 years. Respect for Megler led the Ilwaco railroad to name their Columbia River terminus for him in 1908. The site was initially a fishing station built by Astorian Marshall Kenney in 1880. Megler used the site for a fish receiving station in 1883. The Ilwaco railroad bought the deep water site for their terminus around 1906 and initially called it "Cook's Station". When the first train arrived at the train terminus and ferry dock in 1908 the name had been changed to Megler Station. Automobile traffic finally forced the Ilwaco railroad to discontinue train service on September 9, 1930. Ferries operated by Fritz Elfving and later the Oregon Department of Highways continued to serve the Megler to Astoria run until July 29, 1966, when the last regular ferry operation ceased with the opening of the Astoria Bridge." Source: Larry J. Weathers, Place Names of Pacific County, Sou'wester, Centennial Edition, 1989. In the early 1900s, Megler was the Washington landing of a ferry which crossed the Columbia River to Astoria, Oregon. Today the Astoria-Megler Bridge replaces this ferry. This bridge can be seen just downstream of the Megler Rest Area. All that remains of the old ferry area are pilings in the water. "In 1888, the Ilwaco Railroad and Navigation Company (IR&N) laid the first five miles of narrow-gauge track from Ilwaco toward Long Beach and Nahcotta. In 1906 the IR&N was purchased by the Oregon Railroad and Navigation Company, and the OR&N bought the deep-water site at Megler, which they named "Cook's Station". In 1907 construction of a railroad between Cook's Station and Ilwaco was underway, and in October of 1907 construction began at Cook's Station on a wharf that measured 900 feet long and 120 feet wide. By the time this train and ferry freight dock began operating in 1908, the name of the site was changed again to Megler Station. Once the train began regular operation, the steamer Nahcotta was set up as a passenger ferry service between Astoria and Megler. The Ilwaco Railroad bought several steam locomotives, and by the time the last one was delivered they had abandoned their dock in Ilwaco. Railroad hands built a small spur at Megler to receive the locomotive from the steamer. For the first few months of operation, a temporary tank stored oil near the Megler dock. By 1909, a large, permanent steel tank was erected on a trestle-like structure at the site. A depot, a train shed, and a turntable were also built at the Megler terminal. In 1921, increased automobile traffic in the region induced Fritz Elfving to establish a car ferry, the Tourist I, between Astoria and the Megler dock. Gradually, as the number of automobiles increased, the need for the railroad declined. The Ilwaco Railroad discontinued service in September of 1930, and in 1931 the Washington State Highway Department acquired title to most of the railroad right-of-way. In 1946 the Oregon Highway Department purchased the ferry service and operated it until the Astoria - Megler bridge was completed. In 1956, Washington State Route 12B was constructed east of Megler. The route was later redesignated SR401. 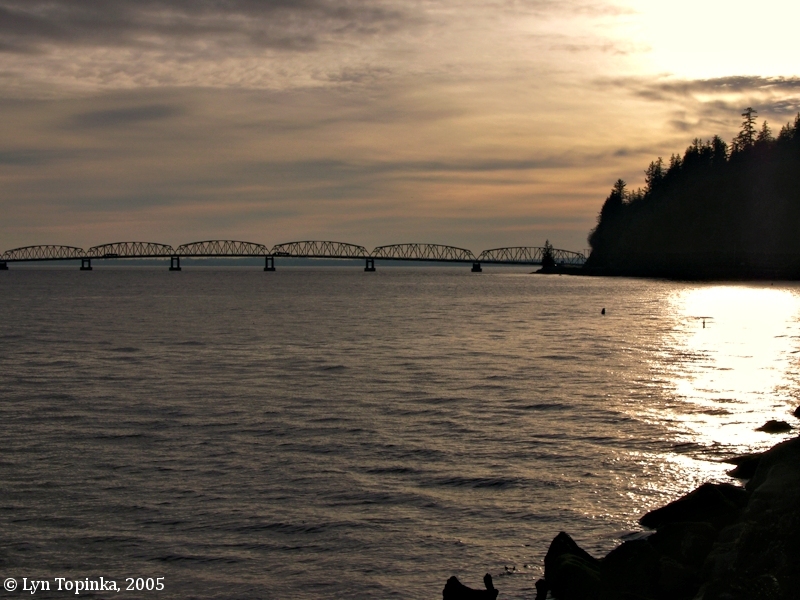 Construction of the Astoria - Megler Bridge began in 1962. The bridge was finished in 1966 and the last ferry run occurred in July of that year. In 1968 and 1969 the Washington Department of Highways demolished the ferry landing and constructed the Megler Rest Area in its place. 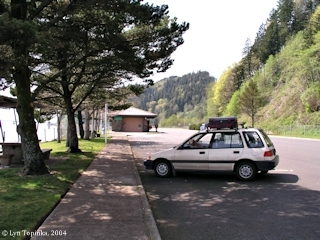 The Megler Rest Area was renamed the Dismal Nitch Rest Area in 2005. ..."
Source: U.S. National Park Service, Lewis and Clark National and State Historical Parks website, 2006. 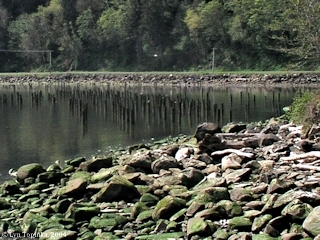 Click image to enlarge Pilings, Megler Cove from Megler Rest Area, Washington. Image taken April 9, 2004. 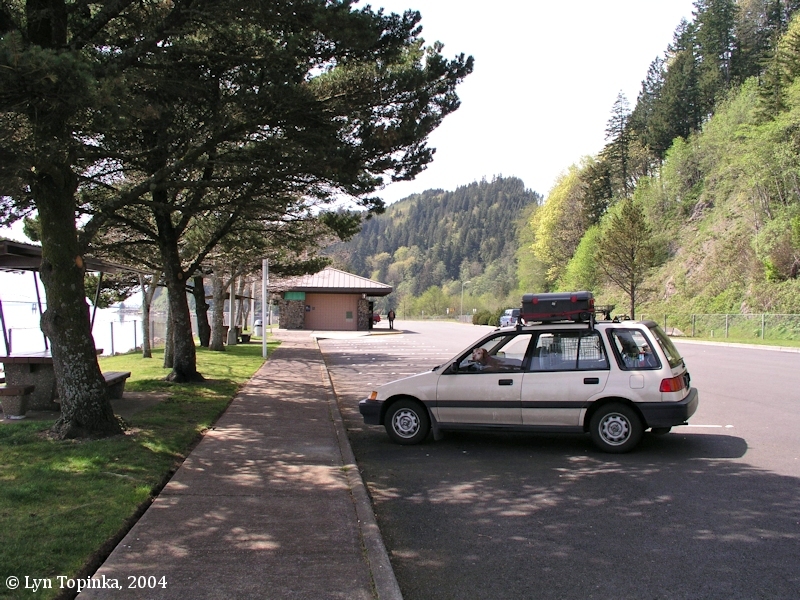 Click image to enlarge Megler Rest Area, Washington, with companion Josie in car. Image taken April 9, 2004. 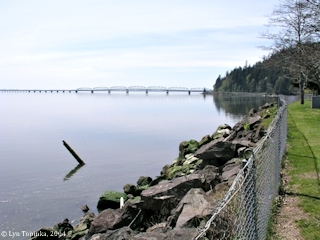 The Megler Rest Area provides great views downstream of Point Ellice and the Astoria-Megler Bridge, across the river of Astoria, Oregon and Tongue Point, and upstream on a clear day views of Mount St. Helens and Mount Adams. Click image to enlarge Tongue Point, Oregon, from Megler Rest Area, Washington. Image taken April 9, 2004. Click image to enlarge Astoria-Megler Bridge and Point Ellice, Washington. View from Megler Rest Area. Image taken April 9, 2004. 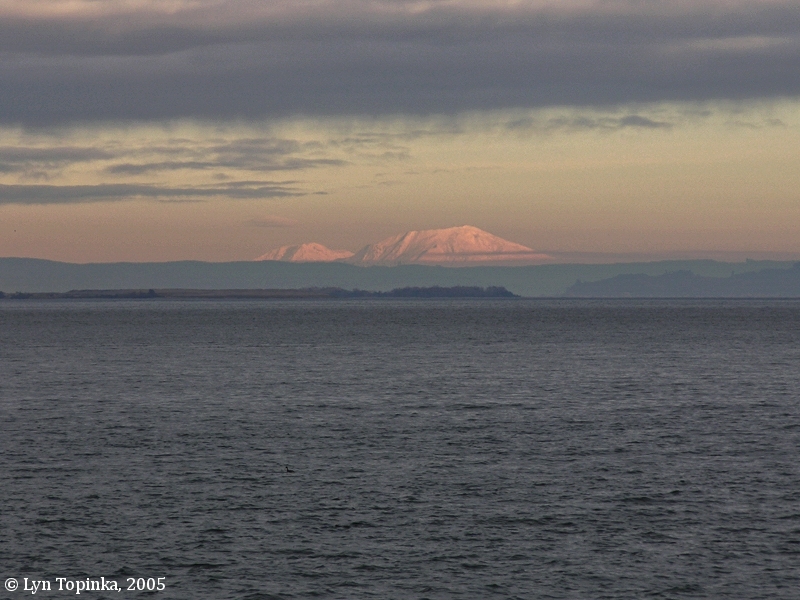 Click image to enlarge Sunset, Astoria and Saddle Mountain, as seen from Megler Rest Area, Washington. Image taken November 9, 2005. Click image to enlarge Sunset, Point Ellice and Megler Cove, as seen from Megler Rest Area, Washington. Image taken November 9, 2005. 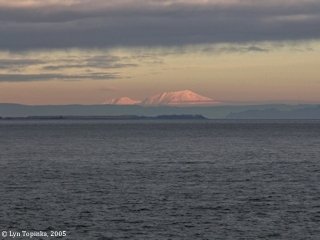 Click image to enlarge Sunset, Mount Adams and Mount St. Helens, as seen from Megler Rest Area. Image taken November 9, 2005. The early 1900s was the "Golden Age of Postcards". The "Penny Postcard" became a popular way to send greetings to friends and family. The Penny Postcard today has become a snapshot of history. Click image to enlarge Penny Postcard: Megler Ferry Landing, Megler, Washington. Penny Postcard, ca.1940s-1950s, "Megler, Wash. Ferry Landing.". Photographed by Boyer. Caption for this image found on the National Park Service Website reads: "The ferry landing at Megler, ca.1927-1856." In the private collection of Lyn Topinka. Click image to enlarge Penny Postcard: Fisherman's Bay (Megler Cove) on the Columbia, ca.1910. Penny Postcard, ca.1910, "Fisherman's Bay on the Columbia River". PNC Series. Made in Germany, Card #3818. Caption for this image found on the National Park Service Website reads: "Photograph of Megler Cove taken from Point Ellice ca.1907-1927. Note the fish receiving station and the cutting and filling associated with construction of the railroad. The Megler railroad terminal is to the right of the photo in the background. The view is to the northeast." In the private collection of Lyn Topinka. S. 45° W. 10 Miles to a Point Distress [Point Ellice] on the Std. side passed a Deep nitch and Six iner points on the Stard Side. the Shore bold and rockey. mountains high on the Stard and thickly Covered with timber principally of the pine kind. wind rose Swills high we encamped at 9 miles in a Small nitch 6 days [two days near Hungry Harbor and 3 days at Megler Cove]. rained &c. a deep bay on the Lard Sid opposit. The Countrey high to the river above the bay on the opposit Side." We had a rainy morning, but the wind was not so high as it had been yesterday; and we set out from Cape Swell [Portuguese Point], coasted along 8 miles, passed some high cliffs of sandy rocks, and then came to a point [Megler Point]; where we found the swells so high, the wind having risen, that we could not proceed; so we had to return back about a mile to get a safe harbour [Hungry Harbor]. Here we dined on some pounded salmon, that we had procured from the Indians; and unloaded our canoes. After we had been here about 2 hours, it became more calm, and we loaded the canoes again, but could not get round the point [Megler Point], the swells were still so high; we therefore put too at a branch of fresh water [near Hungry Harbor], under high cliffs of rocks and unloaded again. Here we scarcely had room to lie between the rocks and water; but we made shift to do it among some drift wood that had been beat up by the tide. It rained hard all night, and was very disagreeable. While on our way down today, we saw some porpoises, sea otter [Harbor Seals or Sea Lions] and a great many sea gulls. The water is become very salt.